I had originally been planning to ski the SW side of Mt St Helens, but as I drove south on Sunday evening, the forecast 12000 ft freezing level for Monday seemed to rule that out. It was getting quite late and I was tired after a weekend of crevasse rescue practice on Rainier. I would need a very early start in order to do that lengthy route on such a warm day, so a better plan seemed to be Mt Hood and the standard ski-the-lifts-and-summit-too routine. So I drove past the St Helens exit, reached the Timberline parking lot by midnight and slept in the car. Monday, April 26, was the first day for Timberline's spring hours (8-2:30), so I yo-yoed the Magic Mile and Palmer lifts for 2 hours as the snow softened to corn and then headed from the top of Palmer towards the summit by 10:15. Instead of putting skins on and later having to take them off, it was clearly faster to just crampon up on foot, and I reached the summit in under 2 hours. The bergschrund on the Hogsback was in great shape, very solidly bridged with the main crack beginning about 50 ft west of the crest (the crack was roughly 100 feet long, maximum 5-6 ft wide). Loosened by the warm sunshine, snow chunks were regularly falling from the rimed rock faces above. Even worse, a grapefruit-sized rock dropped 50 ft from the left edge of the Pearly Gates right into my footsteps behind me just after I reached the safety of the summit chute, so I was glad to be wearing a ski helmet this day. On top, winds were light and all the climbers had already descended, so I had the glorious summit of Mount Hood all to myself. 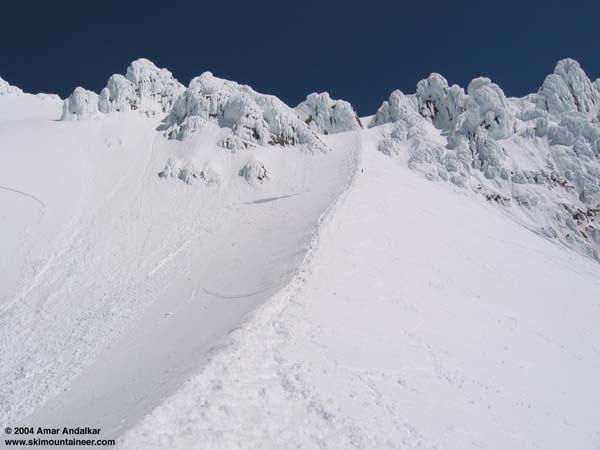 This photo shows the condition of the Hogsback and bergschrund, with the avalanche crown in West Crater visible at left. Click here for a double-size version of this photo.